We at Childline South Africa (CLSA) believe that every child has the right to be safe from harm, and particularly the most vulnerable children. No child should be excluded, but o ften D/deaf (Deaf, hard of hearing, deafened and Deafblind children (a hard to reach group) are excluded, marginalised, exploited, and are twice as likely to be abused as hearing children. According to the Centre for Deaf Studies at the University of Witwatersrand, deafness is one of the single largest prevailing disabilities in South Africa affecting more than 4 million D/deaf people, out of whom 300,000 to 400,000 are profoundly Deaf and whose first language is South African Sign Language (SASL). We also endeavour to make our services accessible for all children, including D/deaf children, so that we can provide services to everyone as and when required. For this reason, we have been working in partnership with DeafKidz International, (a UK based charity working globally to respond to the needs of deaf children in low resource settings) and as a result are now delivering a project funded by Comic Relief, entitled Signing Safe Futures South Africa. • Assisting us in evaluating our own services and making sure they are accessible for D/deaf people, whether they are D/deaf children, D/deaf parents, etc. So if you’re D/deaf, and you need help to report something that’s happened or is still happening to you, you can contact us through our Online Counselling Service, where you will be able to discuss issues with our qualified and specially trained counsellors. They have been trained to understand D/deaf people’s communication, where their first language is signed and not spoken/written, as well as their other linguistic and cultural needs. 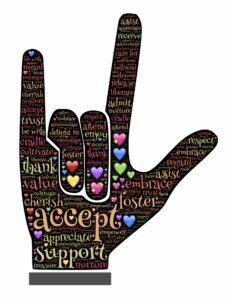 Alternatively, if you would like to meet face to face with a counsellor/therapist, and you use South African Sign Language, we will be able to arrange a South African Sign Language interpreter to assist with communication. The counsellors, as with the rest of our staff, have received Deaf Sensitisation Training. We have three members of staff working on the project, a Project Manager and two Project Coordinators. One of the Coordinators is Deaf – her first language is South African Sign Language. She is working hard to teach the others sign language, providing them with weekly lessons – they’re really keen to learn and are doing well! 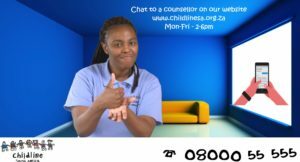 As we progress, we will endeavour to ensure that all our resources are accessible for D/deaf children – for example, you will see video clips below of our website information that has been translated into South African Sign Language. If you meet any D/deaf children and feel they are at risk through isolation, exploitation, etc., or you don’t know how to work with them, then please contact us. If you are a professional organisation and want to know more about working with deaf children, then also please contact us! We can discuss with you what we can offer, and perhaps deliver a presentation about our work and how we can help you. With your support let us all work together to ensure that no deaf child is left behind. For any specific updates on our project activities, please keep your eyes on our Twitter feed, Facebook page and our website.